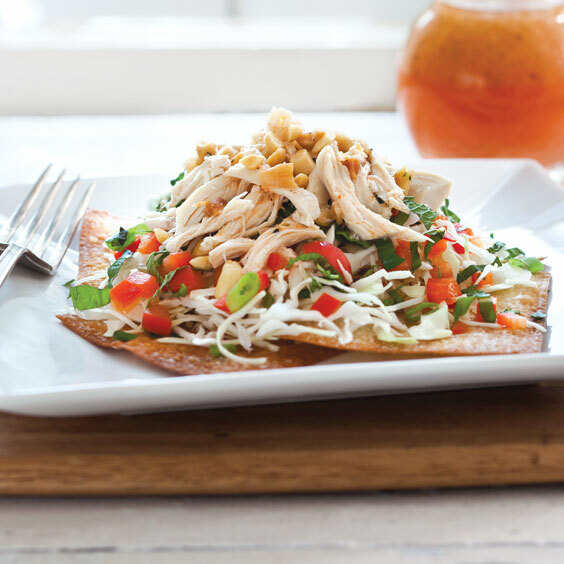 Mint, cilantro, and lime combine to give this Thai Chicken Salad plenty of Asian flair. Served over crispy wontons, it’s so much better than takeout! In a large bowl, stir together coleslaw and next 6 ingredients. Add Lime Vinaigrette, stirring to combine. Preheat oven to 400°. Spray a large baking sheet with nonstick cooking spray. Place wonton wrappers in a single layer on prepared pan. Brush with olive oil, and sprinkle with salt. Bake for 5 minutes or until golden brown. Let cool on pans for 10 minutes. Serve with chicken salad. In a small bowl, whisk together all ingredients. Cover and refrigerate up to 3 days.